The 2-pounder "pom-pom" was developed during the First World War as a naval weapon for defense against both aircraft and motor torpedo boats. 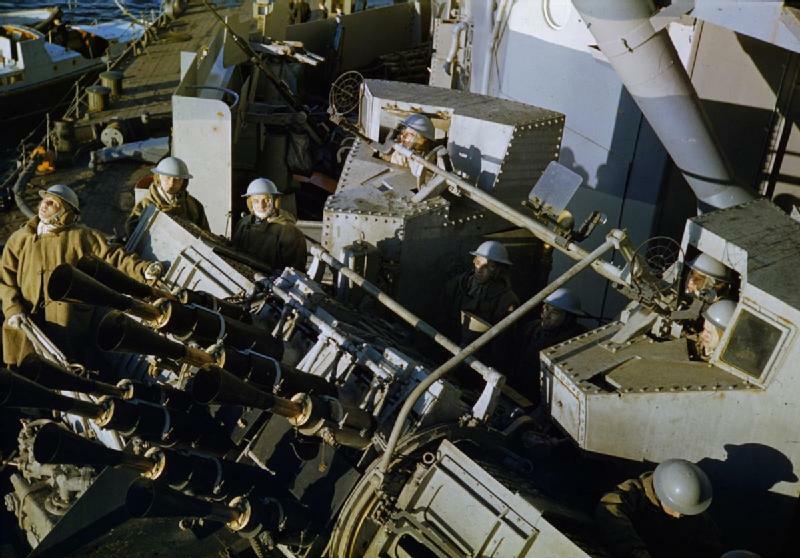 Rushed into production, it proved unreliable in service, but with postwar improvements it became the chief British naval light antiaircraft gun, and remained so throughout the Second World War, only gradually being replaced by Lend-Lease 40mm Bofors guns. The gun was basically a scaled up version of the Maxim machine gun, with a toggle locked short recoil action. It was water-cooled and belt-fed with a good sustained rate of fire, further enhanced by its use in quadruple or eight-barreled mountings. The rounds were self-destroying at 2500 yards (2290m) to avoid friendly fire incidents and to distract enemy pilots with their bursts. However, the muzzle velocity compared unfavorably with the Bofors. 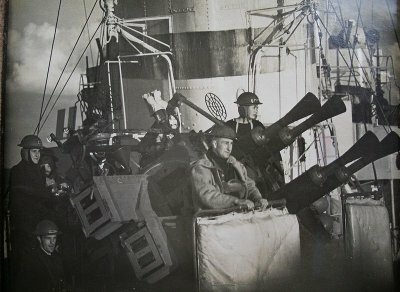 The 2-pounder was also adopted by the British Army as a light antiaircraft gun, but the Army was faster than the Navy to replace it with the Bofors. By the time war broke out in the Pacific, fire control was provided by the Mk IV director, a rather elaborate tachymetric director with gyroscopic stabilization requiring a crew of four. This was too much for quadruple mounts on destroyers, which omitted the director and relied on tracers for correcting aim. The British were pessimistic about the effectiveness of the pom-pom, having conducted tests in which they concluded the gun would have just ten seconds of firing time against a dive bomber, with no more than 5% hits. This meant about a 67% percent chance of scoring one or more hits before the dive bomber released its bomb, which was probably wildly optimistic. However, the weapon was valued for its expected effectiveness against motor torpedo boats in the restricted waters of the Mediterranean.